One American toad can eat up to 1,000 insects every day. The main predators to American toads are snakes. The Eastern hognose snake relies primarily on toads for their diet. Other snakes, such as garter snakes, are immune from the poisons excreted by toads. Toads drink by absorbing water through an area on their lower abdomen called a seat patch. 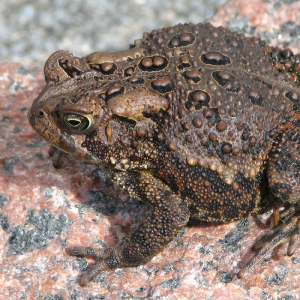 Contrary to popular belief, you will not develop warts if you touch a toad.